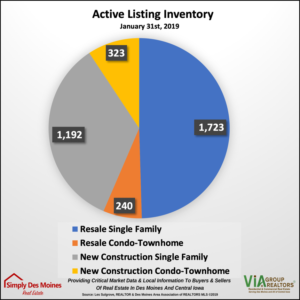 Welcome to a new year in Des Moines real estate! The month of January has proved to be challenging to say the least weather-wise. The month started off mild and seasonably warm. The honeymoon ended quickly with a cold blast that ended the month with all time low temperature setting records not to mention several inches of snow mid month. I never thought I would ever say that I was looking forward to the month of February for the anticipated warmer weather. That little rodent from Punxsutawney had better not see his shadow on groundhog day! Either way, we will forge ahead. This is an exciting issue of SimplyDesMoines Real Estate. 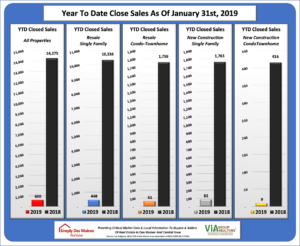 This edition includes a comprehensive review of the 2018 real estate business broken down by single family, condo-townhome, resale and new construction activity. This will be a yearlong resource to refer to as 2019 rolls along. 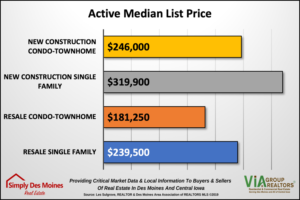 It is delivered in a new web based format that allows you to jump to the area of interest, from an overall review down to 22 of the local metro communities. 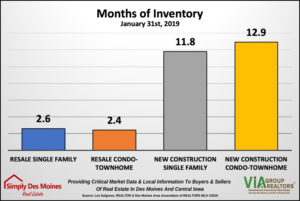 Also this month is the roll out of the 2019 new market statistics also broken down by property type and construction type. Everything is available here in this newsletter and also on my new Statistics-centric Facebook business page Facebook.com/SimplyDesMoinesStats. That site is dedicated specifically to market statistics only. Links and graphics that appear in this email newsletter will also be posted there for easy reference. Please let me know your thoughts and suggestions. 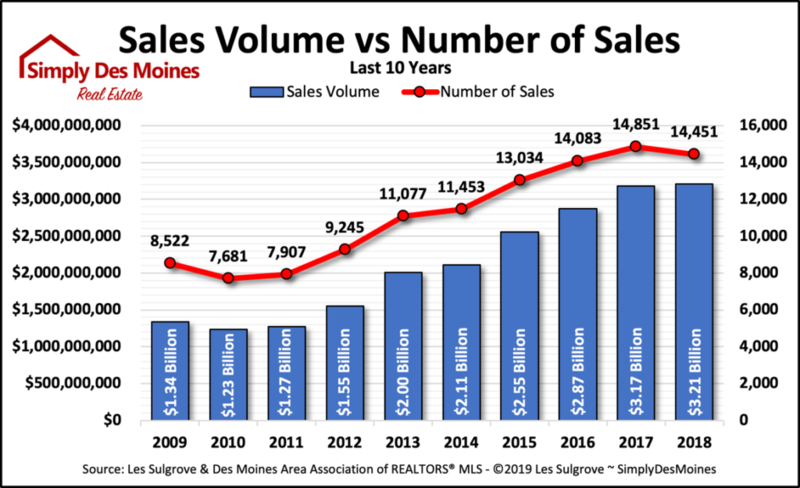 This is the beginning of my 11th year producing and analyzing local real estate market statistics in the Des Moines real estate market and I truly enjoy bringing every graph and chart to you each month. 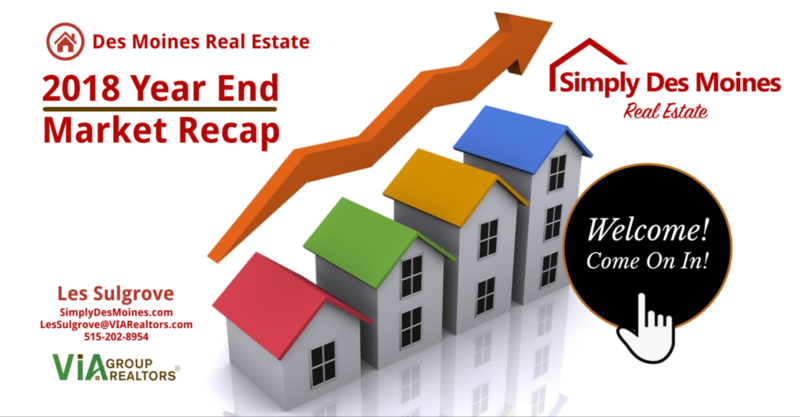 2018 was the year that the sellers began to return to the market. 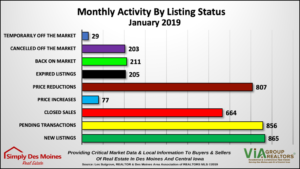 On paper it doesn’t look like a big increase in listing counts, but in fact, the increase fed enough hungry buyers to bring our year-end sales close to 2017. 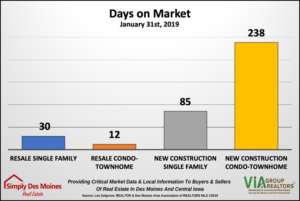 As a result, the number of days on market pushed lower in 2018 in the most coveted price points of the under $200,000 range. With the Months of Inventory levels favoring sellers in that price point, it’s a wonder we had any homes to sell under $200,000 at all. 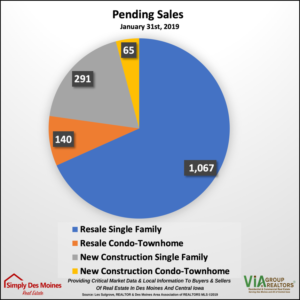 I believe that the overall real estate market in the Des Moines is nearing the end of the Expansion stage. 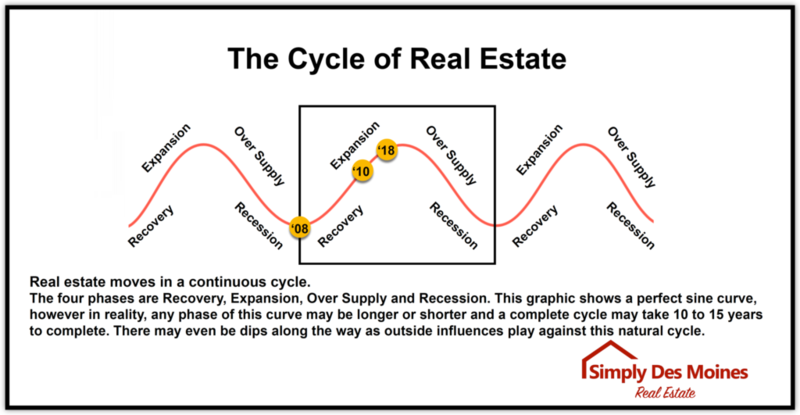 Whether the market will peak in 2019 will remain to be seen, however if I were to apply this same cycle to just resale and new construction separately, my prediction would be that for resale properties, in particular under $300,000, there is more expansion to happen into 2019 and possibly into 2020 barring any national or economic event. 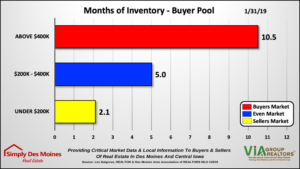 I believe that home sellers in this price point will come out in higher numbers in 2019 as soon as the weather breaks and we should expect to have an even busier spring/summer market than last year. This will also lead to a modest increase in home pricing but tempered by higher mortgage interest rates. 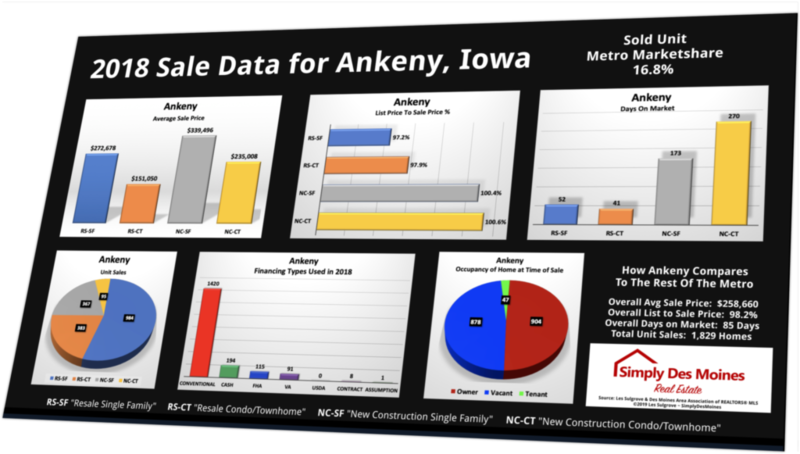 For an even more in-depth analysis of 2018 Des real estate activity broken down by metro communities and also by single family – condo/townhome, resale – new construction, go to the most comprehensive real estate statistical resource at http://facebook.com/SimplyDesMoinesStats. If you are interested in selling your home or purchasing a home, give me a call! 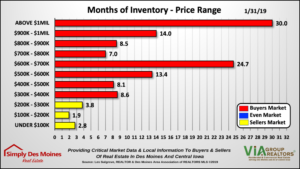 I will help you determine your best strategy based on your local market data.